RodPrjónar: Almost finished shawl! New bobbin lace pillow! 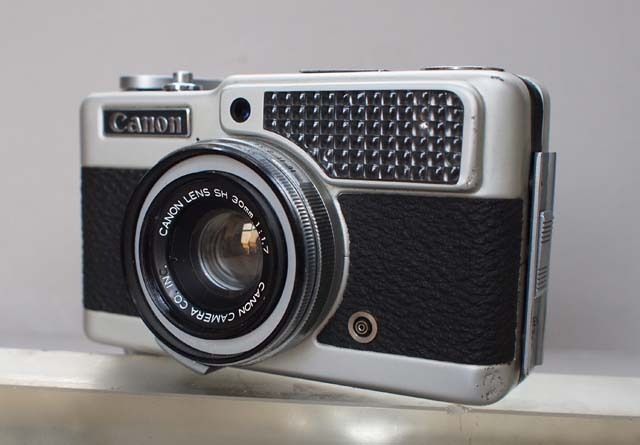 and new camera! Almost finished shawl! New bobbin lace pillow! and new camera! Since the last time I posted nothing much has really happened. I am still knitting the Liliac Shawl. It has been a long long process, especially because I haven't been 100% focused in it. While I was knitting it I finished a lopapeysa and also started to play with bobbin lace... so my time was divided between these three and some other things. Edge: Soon to be finished and ready to be grafted. The shawl is ALMOST done. 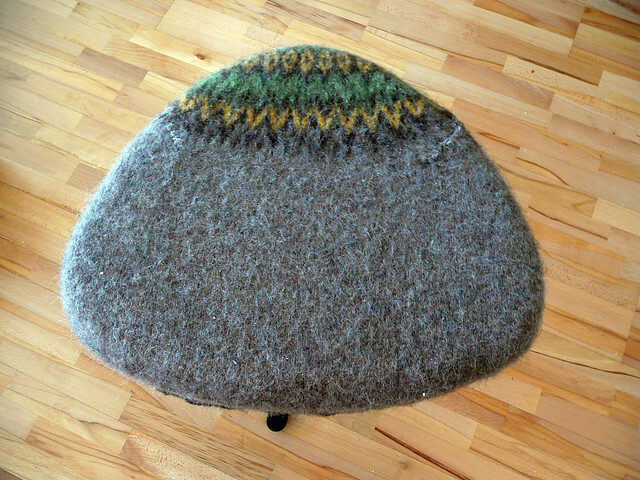 I ended up knitting 34 repeats of the pattern instead of the 30 that I had in mind at first. I don't know what I was thinking when I thought that 30 would be enough! Anyways, I stopped at 34 because I changed my mind about the lace edge. 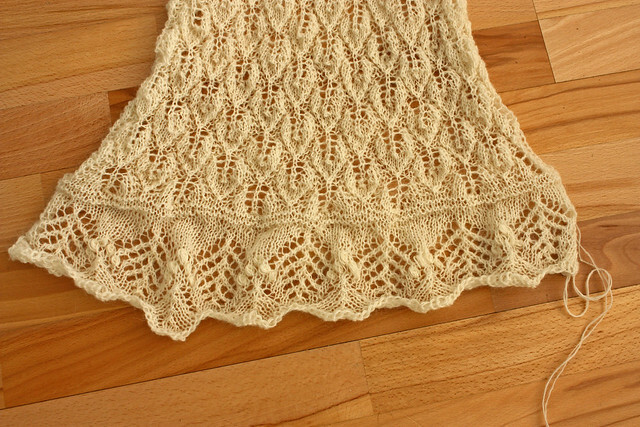 My original idea was to make the lace edge in two long pieces and then sew it all around the body of the shawl. 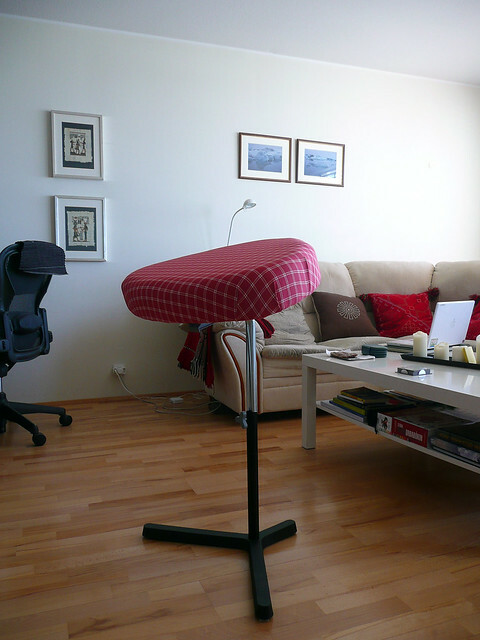 The edge was going to be really simple, with some nupps and no more than 4-5 cm wide. 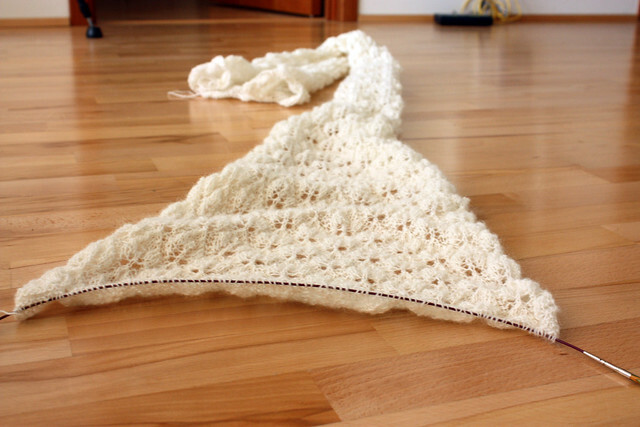 On the way I realized that it would be so much better to make two lace edges for each end of the shawl only and keep the long sides of the body straight with no edge and no scallops. 34 leaf repeats. 1 edge already grafted. Since I decided to change the edges in the very last moment that meant a little bit of an extra work for me. 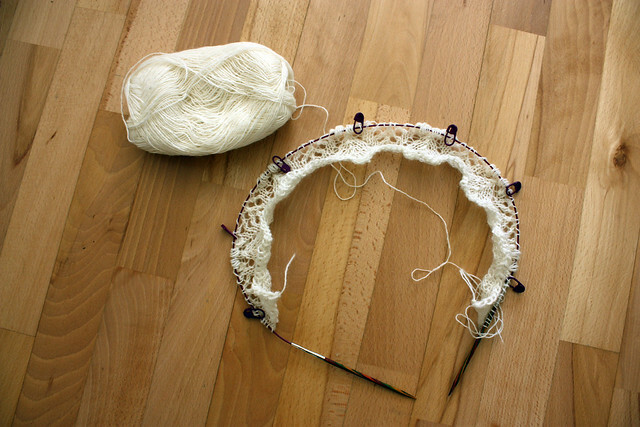 Normally, when a shawl has a lace edge at each end, one must start knitting one edge, then continue with the body and leave live stitched on the other side. 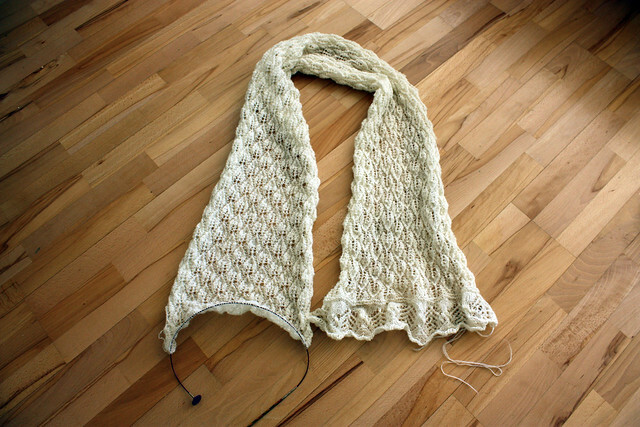 Then, the second edge is knitted on a new pair of needles and finally grafted to the body of the shawl. Grafting is always a challenge, especially when there are 100 stitches to graft. I remember the first time I used Kitchener stitch and I had to turn everything off: no TV, no music, nothing that could distract me and all that for grafting 8 stitches! Now I am much more relaxed about it but I always have to be checking the tension. It is really easy to get the grafted stitches TOO tense and then when it comes to blocking it is possible to break the thread and end up with a TERRIBLE disaster! The thing is that I casted on, knitted the body of the shawl and casted off, thinking that I was going to sew the edge all around. I knitted one lace edge and had to undo the cast off border in order to graft. It wasn't so difficult. The difficult part was to undo the cast on border to get the live stitches there. Uff. Everytime I knit stoles I use the knitted cast on technique (I think it is the best cast on for this kind of projects... it VERY elastic). 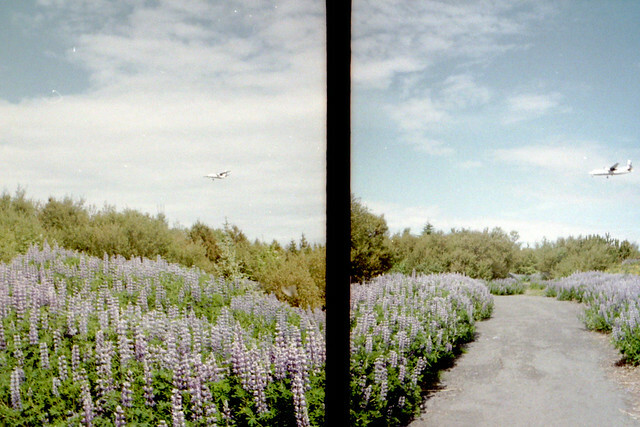 Undoing it was a long process. It must have taken me about an hour to undo 100 stitches. Live stitches waiting to be grafted. Now, I have the live stitches and I have already began the secong lace edge. I am very excited about blocking this!! Can hardly wait to see it finished! And begin a new, fresh project! 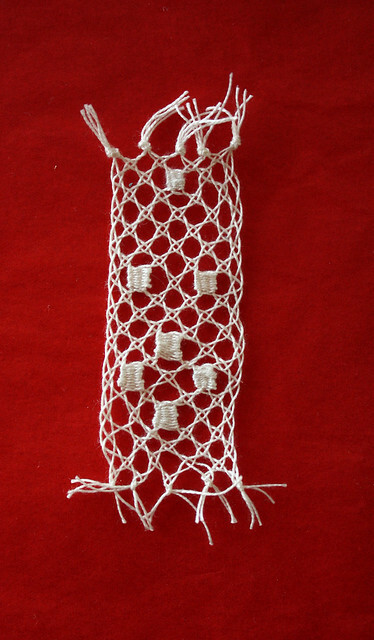 About bobbin lace, I am still making exercises. I am done with seven so far (out of 10). 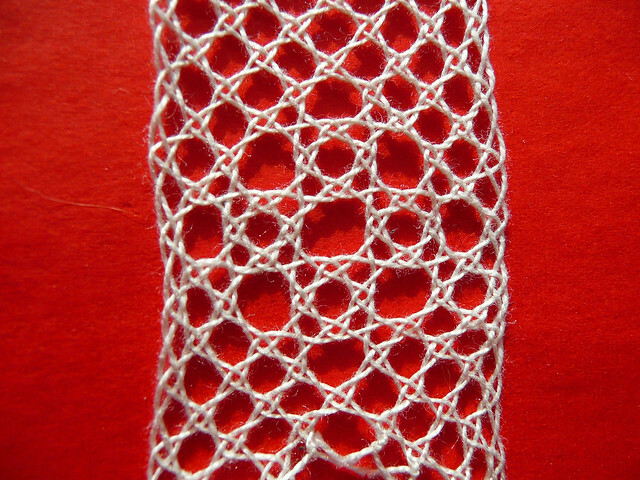 Filigree stitch (punto de filigrana). This one is pretty simple and fun to make. It is a combination of half stitch and cloth stitch torchon. This is the Spirit stitch (punto de espíritu). It is very tricky to make the spirits (the squares suspended in the net are called spirits). It is a bit difficult to have perfectly square. To get the right shape it is necessary to keep the bobbins of the sides very tense all the time, if not the result is an inverted triangle. 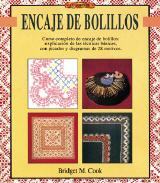 In the book there is a funny line at the end of the exercise that says that getting a perfectly square spirit is a reason to feel proud for a FEMALE bobbin lace maker (encajera in spanish). The book is clearly written for women :p I guess I should be proud... my spirits are not so bad to be the first time, aren't they? I also made a new pillow. 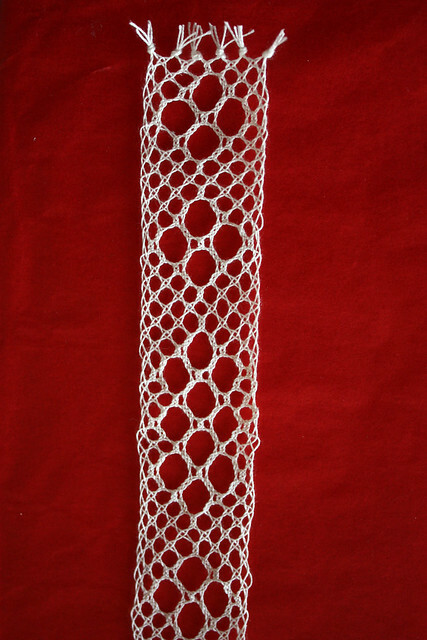 I was looking around in the internet searching for bobbin lace blogs and an amazing blog from Asturias came my way! 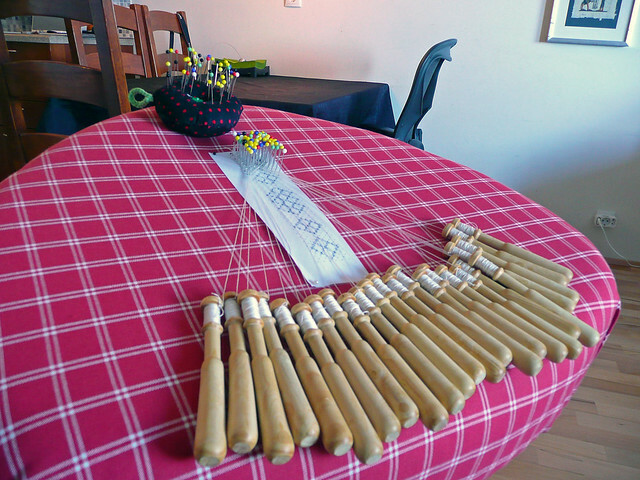 There I found a great idea: An Ikea table converted in a bobbin lace pillow. Brilliant! 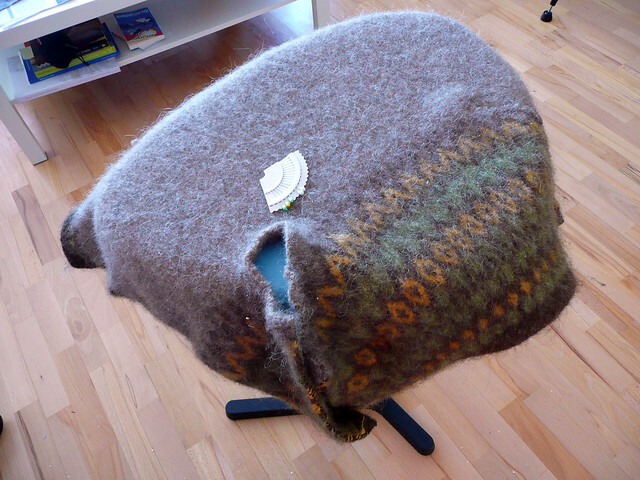 * Old lopapeysa (well, actually brand new, never finished because I didn't like it) that I felted in the washing machine (40°C). The result is an incredibly thick and dense fabric. 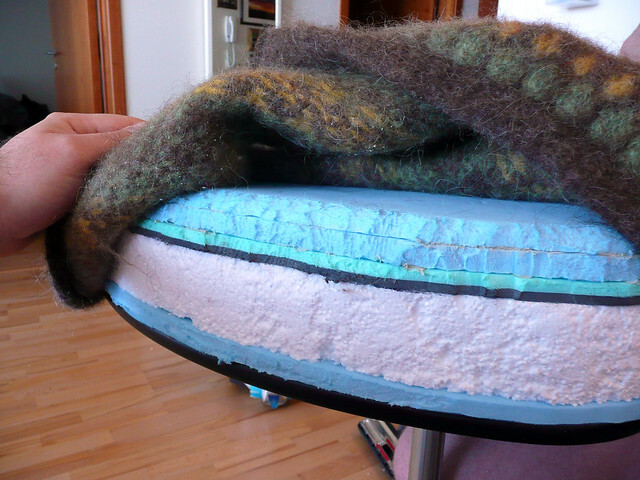 Cut the sleeves of the felted lopapysa, ready to sew the holes. Holes are sewed and fabric is stretched. Cotton fabric on top: Ready to be used! With the leftovers I made a pin cushion. It works really well but I am thinking about shaping the foam a little more to make the border more rounded, I think that it is too flat and square as it is. I still have to try it some more and see. A few weeks ago I got a new toy. 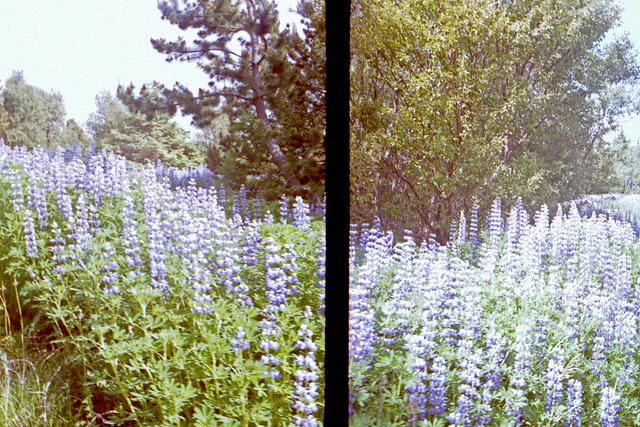 I bought an old half frame camera (that means that it is possible to take two pictures per frame of film, so it is possible to make 72 pictures out of a 36 pictures film, neat!). 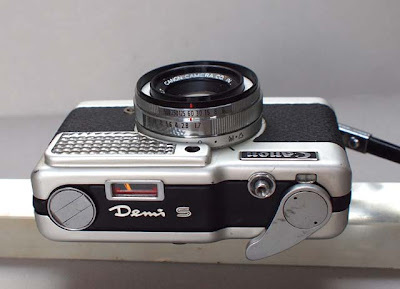 The camera is a Canon Demi S. It was made in 1964 and it is working amazingly well! The selenium photosensor still works well so the lightmeter is pretty reliable. Beautiful piece! 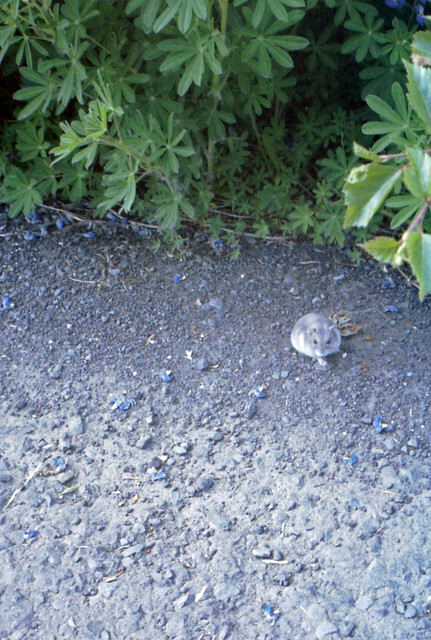 I was walking and I saw a little piece of fur next to the road. At first I thought it was a pouch or something like that until this little thing decided to show the face. It is not a mouse... it didn't have a long tail. Is it a wild hamster!? Ya quiero ver ese chal bloqueado!! Te va a quedar padrísimo. Y tu nueva cámara está genial! Por dios eres el amo de las manualidades. A mi me encanta usar y reusar, no tirar nada y el cojín para bolillos lo encuentro genial. Langsjalið er ekkert smá fallegt hjá þér! Til hamingju með að vera næstum því búinn með það! :-) Bobbins-púðinn úr IKEA borðinu er ekkert smá sniðugur hjá þér... hlakka til að sjá þróunina á honum hjá þér. 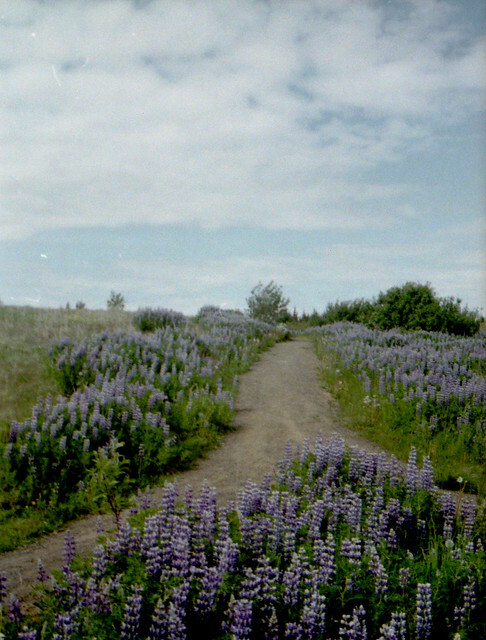 Myndirnar sem þó tókst með gömlu myndavélinni eru æði! Martha, el chal ya está bloqueado!! Lo hice ayer. Quedó precioso y MUY grande! No puedo parar de mirarlo, jeje. Rosalía, el nuevo cojín (o mundillo) es MUY cómodo y lo mejor de todo es que fue MUY barato! Alex, la mesita de Ikea la lleva! jeje. El chal ya está finalmente listo! Sólo me queda rematar unos detallitos y ya! Listo para ser regalado! El cojin quedó buenisimo, aunque te aviso que el uso del sweter me dolió un poco, yo creo que aún tenía esperanza de ser abrigo para alguien jaja. Un abrazo y buen tejido! Sjalið er aeði og ég hlakka til að sjá myndir af því eftir að þú ert búin að strekkja það! Frábaer hugmynd með borðið og þetta bobbin lace er mjög svo spennandi!! Takk sömuleiðis fyrir síðast, þetta var alveg frábærlega skemmtileg kvöldstund - þurfum að endurtaka þetta sem fyrst aftur með sama fólki. Og vá hvað ég hlakka til að sjá myndir af þessu strekktu!! Þetta er ótrúlegt afrek! I can't believe it. I was finishing up a note to you and suddenly got the notice that there was a problem and Windows had to shut down. It then restored itself, but of course, my entire comment was lost! Will try again later. ¡¡Cúanto has avanzado con los bolillos!!. Dentro de poco tendrás que pasar a hacer alguna piecita para poner en práctica lo que estás aprendiendo. El Chal es una preciosidad no me extraña que estés tan contento del resultado.